Twitter: Easy, rough and raucous. Journalism: Tough, refined and reflective. Can a marriage of this odd couple endure? If the answer is “no,” it won’t be for lack of interest in a meaningful relationship. Attracted by Twitter’s rapidly growing hegemony over breaking news, publishers are struggling to thread the social medium’s chaotic feeds into legacy media’s fabric. The result is a 21st century amalgam, an uneasy alliance in which Tweets and video clips disrupt and enhance their print progenitor. Thompson presented his analysis during “The Future of News Organizations in an Increasingly Social World,” a discussion held during Social Media Summit 2013 sponsored by The New York Times and BBC Academy’s College of Journalism. 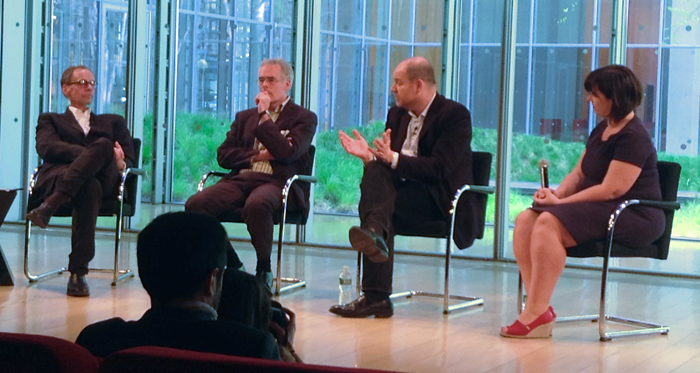 Participants were (pictured left to right) David Carr (moderator), Media Columnist for the New York Times; Peter Horrocks, Director of Global News at the BBC; The New York Times’s Thompson; and Janine Gibson, Editor in Chief of Guardian U.S.
Publishers must also package editorial in a format that exploits the characteristic engagement of reader and device. “If we panned a camera around the audience here we would find that from 30 to 40 percent of people are using smart phones and small laptops,” said Thompson. “We need to think about the behaviors that go with these different form factors, then work out the best way to put content in front of people. We need to create really effective, clever, attractive environments which make the best use of the screen and the rest of the device.” High quality apps are part of that environment. “You can already feel that people do not want 900 apps, but a smaller number that do what they do excellently,” said Thompson.